The Oral History Center is pleased to release a new life history interview with leading winegrower Phil Freese. Philip Freese is a co-founder and co-owner of Vilafonté, a South African winery that produces varietal red wine. Freese was born in 1945 in Indiana. He was educated at Purdue University (BS) and University of California Davis (PhD) where he studied biochemistry. He left the field of biochemistry to pursue a career in the wine industry in 1978, first working as vineyard manager for a CalPlans vineyard in Napa County and then, beginning in 1982, as a winegrower for Robert Mondavi, eventually becoming Vice President of Winegrowing. In the 1990s he started both a wine consulting firm, Winegrow, and, with his wife winemaker Zelma Long, the winery Vilafonté in South Africa. 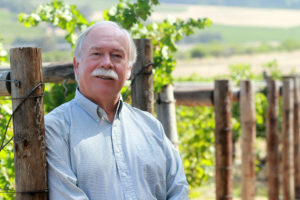 In this interview, Freese discusses the following topics: upbringing and education in science; early career as a biochemist; the evolution of the California wine industry from the 1970s through the 1990s, with a special focus on Napa Valley and viticulture; the multiple facets of viticultural practice and research, including the definition of “winegrowing”; the North Coast Viticultural Research Group; Robert Mondavi Winery in the 1980s and 1990s; vineyard consulting practices; the wine industry in South Africa from the 1990s through the 2010s; and Vilafonté Winery in South Africa. This interview will be engaging to anyone interested in wine from the lens of science, farming, or just sheer pleasure. Freese was one of the American pioneers of the idea of winegrowing, or the notion that wine is made primarily in the vineyard, less so in the cellar — that to make good wine, what you need first and foremost is quality grapes. So, Freese discusses in great detail the history of learning better viticultural practices from irrigation to vine canopy management.